PETA is excited to be taking advantage of new parody rules in order to launch ForceFedAndMurdered.com, reflecting Fortnum & Mason's shameful support of the foie gras industry. Fortnum & Mason still sells foie gras, an unethical food product made by force-feeding terrified ducks and geese until their livers become diseased and swell to up to 10 times their natural size. As their livers become diseased and swell to up to 10 times their normal size, pressing against the lungs, the terrified birds pant constantly and often can no longer stand up or support the weight of their distended organs. It's illegal to produce foie gras in Great Britain because it's so cruel. Veterinarians and avian experts agree that it's impossible to produce foie gras humanely. And it's a scandal that Fortnum & Mason, a store that trades on its British heritage, continues to sell foie gras, buying from foreign suppliers who abuse animals. Our undercover footage, narrated by Sir Roger Moore, shows exactly what happens on French foie gras farms that supply Fortnum & Mason's distributor, where birds are force-fed and murdered for profit. 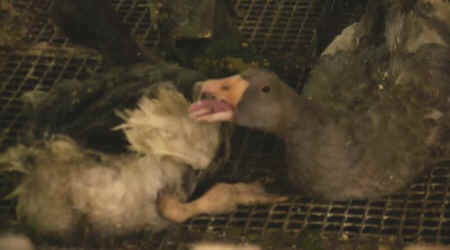 Sign this petition to tell Fortnum & Mason to STOP selling foie gras!